Throughout your workday, be sure to take breaks periodically throughout the day. 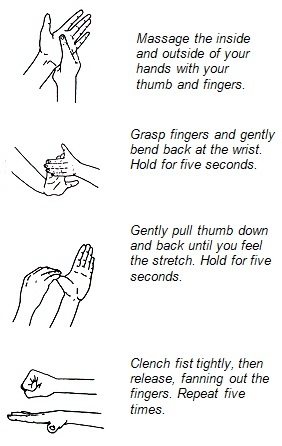 Do hand exercises on a regular basis, stand and stretch slowly, take a few deep breaths, and follow the 20-20-20 rule. Every 20 minutes, glance out a window or look at some distant area at least 20 feet away, for about 20 seconds to relax your eyes. Once you start incorporating breaks and stretches into your daily work habits, you'll notice a big improvement in your efficiency and comfort.